Managing Google AdWords can be much easier through the use of special scripts that automate certain tasks for you and help optimize your setup’s performance. If you have any kind of coding experience whatsoever, you can probably learn how to write your own scripts using Google’s own tools. If not though, there are tons of free scripts out there that can help take your AdWords game to the next level. Here are 75 of the best scripts out there today. Enjoy! The AdWords Quality Score assesses the relevancy of keywords within your account. By optimizing this score, you can decrease the cost per click of your ads. This script will graph your score out in an easy-to-see format and track your score for you, which is oddly not provided in the base toolset. This script will shut down all keywords that don’t generate any impressions. You can adjust how often it runs. Broken URLs happen, and this script will find them automatically so you can correct them. This script will track down anomalous data and outliers that deviate from your expectations. Auction Insights script pulls data from Auction Insights so that it can be analyzed along with your AdWords data. Adjust your bids 24 times a day with this script by BrainLabs. Set a minimum and maximum bid adjustment at the campaign or ad group level. It pauses the lowest CTR ad in each ad group. Ad groups with no active keywords are automatically paused. Checking over 30 days, keywords with a score 5 or under are paused. This script performs a monthly clean-up and suggests ads to remove. Adjust your bids based on stock market performance. Apply bid modifiers based on the weather. Keep track of all your rules in a Google Spreadsheet. This script tests bids and records results in a spreadsheet. Decipher your budget settings on a daily basis. Schedule day to day. Set a bid adjustment percentage for cheap conversion keywords. If strange things are happening in your account, you will receive an email. You will receive an alert when your ads receive zero impressions. Enables sending text messages via Twilio about your account. Fetch live data and dynamically insert it into your ads. Calculate hours remaining in a promotion and put it into the ad text. Map your competitors’ data over time. This is useful for large accounts. Get around AdWords testing limitations and test just about anything. See how your performance changes hour by hour with this color-coded heat map. Show entire account performance in a spreadsheet. Graph out keyword performance in a spreadsheet. This script provides suggestions to improve mobile landing pages. Keep track of historical data in a spreadsheet. Keep track of month-to-month data. Runs a battery of checks and suggests enhancements to your account. This script handles keywords that convert too expensively. Update your keywords automatically for the holidays (and change them back). Updates with new ad text on January 1st. Fill out organic keyword positions in a spreadsheet then this script will match that to your PPC account. Copy labels from old campaigns to new ones. Track effectiveness of each ad group, ad, keyword, etc. by labeling when they receive their first impression. Label keywords recently added to your account. Compare data from yesterday to the day before to the same day last week. Use Google Analytics to track all your script runs. Track CPAs of your keywords. State parameters to add if missing from campaigns. Fixes capitalization errors in your ad text. Manage your account with Excel instead of Google’s spreadsheets. Tracks when an ad creative test starts. Choose the best performing ad. Save time and switch ads over quickly. Use WooCommerce to disable ads for OOS products. Notifies you via email when certain metrics hit statistical significance. Contains many features for managing keywords. Create a master negative list to share across accounts. Reverse the close variant matching of your keywords. Analyzes your search query report to work out keyword performances. Control your scripts with a Google spreadsheet. Verifies the time and time zone for turning ads on or off at a specific time. Convert RSS XML script to JSON. Pause old campaigns and copy to one big campaign. 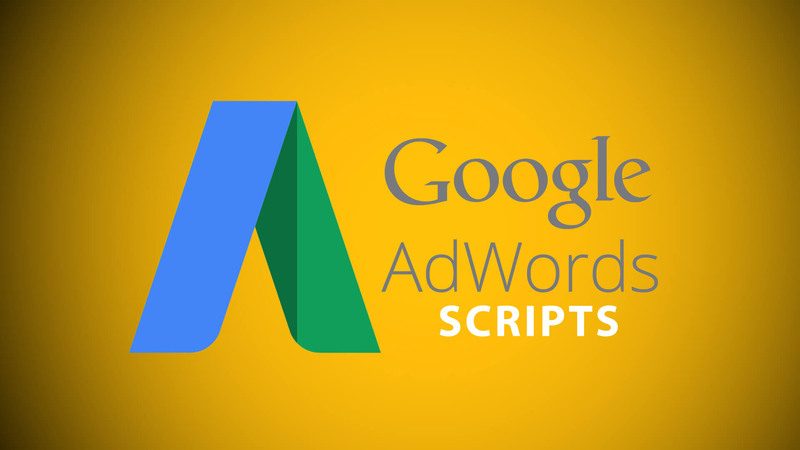 Manage campaigns with a script instead of within the AdWords interface. Manage several parts of products within an ad campaign. Manage your Google Display Network campaigns with scripts. Builds deep links to an entity with issues to identify problems. Use Google’s Prediction API to gain insight into your PPC data. Generates reports on campaign and keyword performance. Generates a report on ad groups that are declining in performance. Sends daily alerts about performance. Compares the CTR of two ads with many impressions to choose the best. This script sends an alert when your campaigns reach target CPA. Inserts data into your ad parameters. Set a budget and pause ads automatically when it’s used up. Update your bids on a large scale from a spreadsheet. Connect your Salesforce CRM to report salesflow. This script checks ROAS/PPC performance between mobile and desktop devices and suggests bid modifiers. This script enables the removal of disapproved ads in bulk.